Trilogy is a building that will have three parts - office, hotel and residents. APH tried to sell the office component and failed. 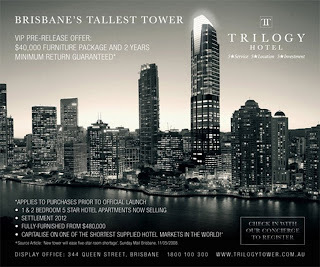 See Brisbane's $300m Trilogy tower campaign fails from The Australian. APH managing director John Wilson said a funding package, led by the Bank of Scotland, was now in place for Trilogy and negotiations finalised with builder Laing O'Rourke. "At no stage have we hesitated," he said. A deal had been signed with a five-star hotel operator and would be announced soon. Marketing would begin this month on the sale of the 192 one- and two-bedroom hotel apartments, which would range in price from $500,000 to $900,000. The 110 residential apartments at the top of the tower would be priced between $1 million and $5million. A start of work on the $700 million Trilogy -- which APH said would be taller than any other existing building in Brisbane -- would confirm the race had begun to deliver the city's next generation of super towers. However, with funding difficult in the wake of the credit crisis, analysts believe many of the developments proposed for Brisbane will fail to materialise. With timing now crucial, GPT Group has started work on its $500 million 111 Eagle Street tower nearby, and work is under way on Austcorp's $1 billion Vision tower. APH has begun demolition on its site between Queen and Adelaide streets and expects to start construction next month. Mr Wilson said special techniques would speed construction and allow delivery of the office space by May 2011. "As far as we know we will be first to market, in terms of buildings that are about to start," Mr Wilson said. Meanwhile, Metacap Developments -- a joint venture between Sydney-based Newell Palmer Securities and Brisbane developer Alex Jimenez -- has announced it will start construction in the new financial year on its $500 million Empire Square tower on Elizabeth Street. It secured a deal last year with five-star hotel operator Westin over the 306 hotel rooms and 104 branded apartments. Empire Square will include about 23,500sqm of A-grade office space.